Saving money should always be an option for your company, even if you aren’t financially struggling. We’ve put together a list of simple ways that could cut your business costs. With more potential customers online than ever before, advertising does not have to be expensive. Start with building an online presence by creating a website and a Facebook page. Tweet about your business on Twitter, publish images on Instagram and create an email newsletter. Social media is a huge marketing tool that really helps to promote a business. Once you’ve got to grips with your digital presence you can start to look at digital advertising through social media and Google. Doing it this way is a lot easier to target just the right sort of people and also keep a close eye on Return on Investment. You can save a lot of time and money by avoiding unnecessary trips. Use online resources like Zoom and Skype to conduct meetings with people in multiple locations rather than traveling to visit them in person. Outsource Bring in freelancers or contractors for short-term jobs. You won’t have to pay a full-time salary with benefits to employees who you may not need after a project is completed. Also, take on interns, this way you are providing them with experience and they are helping you for a low cost. Changing some of your business practices to be more environmentally friendly can save you money. 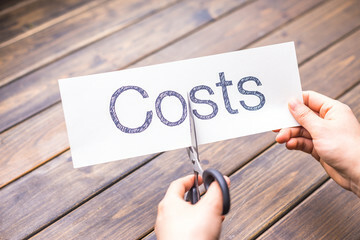 Energy is one of the largest costs most businesses face, so by reducing your energy consumption by even a small percentage, you can cut some business costs. Employees are the largest expense for most businesses, and that money is paid up-front, before those employees are able to start making money for your business. It is essential to retain employees long enough to capitalize on that up-front investment you make in hiring them in the first place. The longer an employee stays with your company, the less money they cost you. Read our blog post on How To Retain Your Employees. Most businesses spend a lot of money on marketing efforts that do not ever produce. By reviewing your marketing strategy, you can find places to save money. Start by having a look at marketing strategies from a few years ago and how they helped. As said before, make your mark online and tap in to the most powerful marketing tool of all – ask your clients to recommend you!